Belyakova A.A. Regional’naya politika kak instrument realizatsii geoekonomicheskikh interesov gosudarstv [Regional Policy as an Instrument for Realizing Geo-Economic Interests of States] Avtoref. dis. … kand. polit. nauk. Chelovek i nauka, available at: http://cheloveknauka.com/regionalnaya-politika-kakinstrument-realizatsii-geoekonomicheskih-interesov-gosudarstva. Putin: SShA khotyat podchinit’ Rossiyu svoemu vliyaniyu [The US Wants to Subordinate Russia to Its Influence]. TASS, 2014, November, 18, available at: http://tass.ru/politika/1580965. Amerikanskaya strategiya v Evrazii [American Strategy in Eurasia]. Nezavisimaya gazeta, 1997, October, 24. Makinder Khelford Dzhon [Mackinder Halford John]. 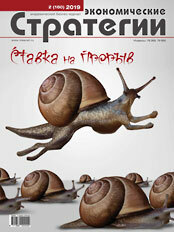 Poznavatel’nyy resurs dlya dumayushchikh i lyuboznatel’nykh, available at: http://www.zerkalov.org.ua/node/4740. Evraziyskie transportnye koridory XXI veka [Eurasian Transport Corridors of the XXI Century]. Institut geopolitiki professora Dergacheva, available at: http://dergachev.ru/images/latest-geopolitics/lesson5_005.jpg. Dergachev V. Shelkovyy put’ Bol’shoy Evrazii. Kitayskiy superproekt veka [Silk Road of Great Eurasia. Chinese Superproject of the Century]. Institut geopolitiki professora Dergacheva, available at: http://dergachev.ru/geop_events/010516-01.html#.WmYRBKAY4kR. Shelkovyy put’ vse uverennee stanovitsya na nogi [The Silk Road is More and More Confidently Getting on Its Feet]. InoZpress.kg, 2017, February, 10, available at: http://inozpress.kg/news/view/id/50656. Slipenchuk M.V. Transaziyskaya sistema klasterov: geopoliticheskiy forsayting [Trans-Asian System of Clusters: Geopolitical Forsighting]. Moscow, Akademkniga, 2009. Ryskulov D.M. Transaziyskiy koridor razvitiya [Trans-Asian Corridor of Development]. Global’naya initsiativa XXI veka, 2017, May, 21, available at: http://group-global.org/ru/publication/122204-transaziyskiy-koridor-razvitiya-globalnaya-iniciativa-xxi-veka.